This recipe is just a bit different from a traditional Italian minestrone soup recipe, but not by much. It just has a couple of added vegetables, which is a nutritional bonus. Check out the Nutritional Analysis below to see how amazingly healthy this soup recipe really is. Enjoy this wonderful Italian soup alone as a meal in itself with some Italian crust bread or serve it as a first course. Soak the beans overnight in water to cover generously. Heat the oil in a large pot. Add the garlic, onion, escarole or other greens, tomato, celery, carrots and potatoes. Cover and cook over moderate heat for 15 minutes, stirring now and then. Add the beans with water in which they were soaked, the broth, salt, pepper, oregano and parsley. Cover and simmer until the beans are tender, about 1 1/4 hours. Add the fava beans or green peas and spaghetti. Simmer for another 15 minutes, stirring occasionally. This soup is preferred quite thick. If you like a thinner soup, add more hot broth or water. Serve hot steaming bowls of minestrone with the grated cheese sprinkled on top or pass a bowl of the cheese for sprinkling. If you don’t want to start from dried beans, you can substitute 2 small cans (14 ounce) or one large can of either bean. If you want to start from dried beans but don’t have time to soak them overnight here is another method: Place the beans in a large pot of unsalted water. Bring to a boil. Boil for 1 minute, then turn off the heat. Let the beans sit in the hot water for 1 hour. They will be about the same consistency as the beans you soak overnight. Use another pasta shape instead of the spaghetti. Small shells, orecchiette (ears), elbows or any other small shaped pasta works just as well. The recipe calls for whole wheat pasta, but feel free to substitute white pasta if you prefer. 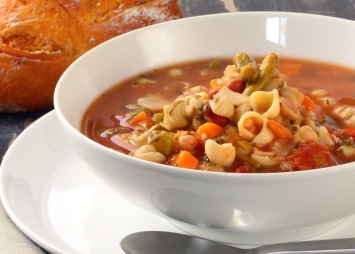 This minestrone soup recipe is so healthy. 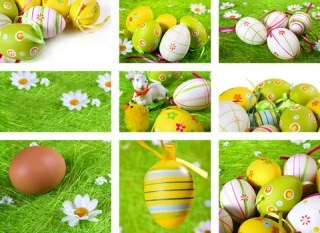 It is relatively low in calories and fat and has no cholesterol. Also notice the Nutritional Analysis above. You will find that each serving of this minestrone soup has more than 10 grams of protein and is high in fiber. Check out the vitamins in this recipe too. Each serving has almost a full days requirement of Vitamin A and 1/3 of our daily requirement of Vitamin C. This one little recipe is a nutritional powerhouse. Italians call soup minestra, so you can see where minestrone gets its name. It basically just means soup. And this is a delicious, healthy one. You can serve this minestrone soup recipe as a meal in itself or combine it with another of our fantastic Italian recipes.